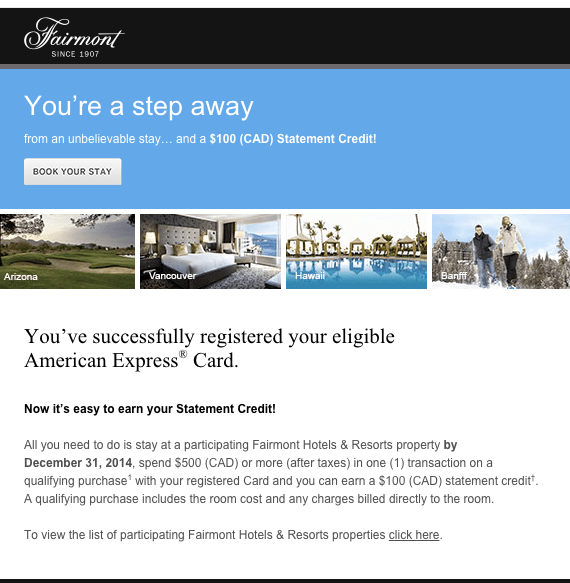 American Express Canada is offering a $100 statement credit with a $500 spend at Fairmont Hotels and Resorts. This offer I believe was a targeted statement credit last year, but this year there aren’t any terms on cardholder eligibility specifically. That means cards like the American Express Gold Card, the American Express Aeroplan Gold Card, the Starwood Preferred Guest Card and the Platinum Card can be registered. Supplementary cardholders are also eligible. You must register your card before December 30th, and stay before December 31st. The $500 spend must be in one transaction. 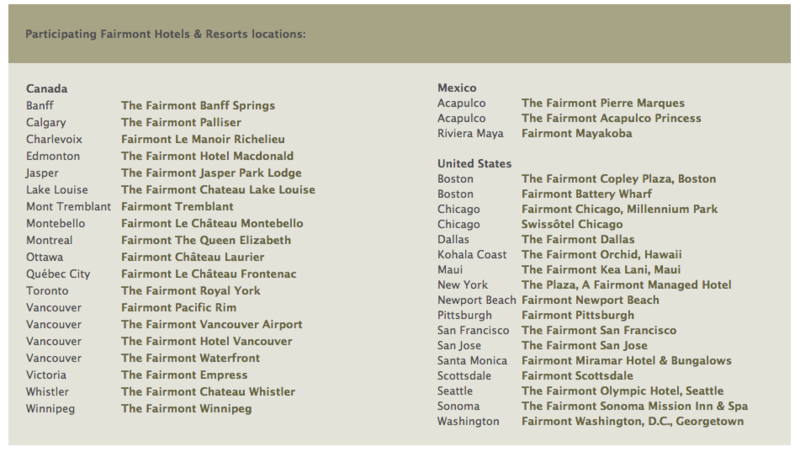 The spend must also be made at participating properties, which include most North American Fairmont Hotels. The statement credit may take up to two billing cycles to appear on your statement and up to 8 weeks to be credited to the account. To enroll, you have to fill in your card number and other personal information. After you submit the form, a confirmation email will be sent. This is a pretty fantastic promotion, in my opinion, as you’re essentially getting a 20% rebate on your first $500 of spend at a hotel. This is especially lucrative with the American Express Platinum Card, because you can in some cases stack your spend with a Fine Hotel and Resorts rate, which I wrote about here. As well, since the Platinum card offers a fastrack to top-tier elite status, it’s quite a significant rebate if you do plan on staying in a Fairmont.